Is this band even real? They have a ridiculous name like some villain improvised by a child telling a story, a release schedule so rapid that this review might be closer to the release date of their next record than this one, and plans to release five albums this year alone. From the very beginning they were a strange entity in garage rock, with seven members and a tendency to produce shrill, loud, ear-splitting noise at a moment’s notice. Their treatment of genres as a series of ice cream flavors to be sampled at their discretion like an indie rock Opeth has lead to a lot of critical acclaim, and while that is unlikely to change with FLYING MICROTONAL BANANA on the basis of pure instrumental talent, the mixing, length, and inconsistency eroded my enjoyment and made it hard to focus on the record’s strong points. 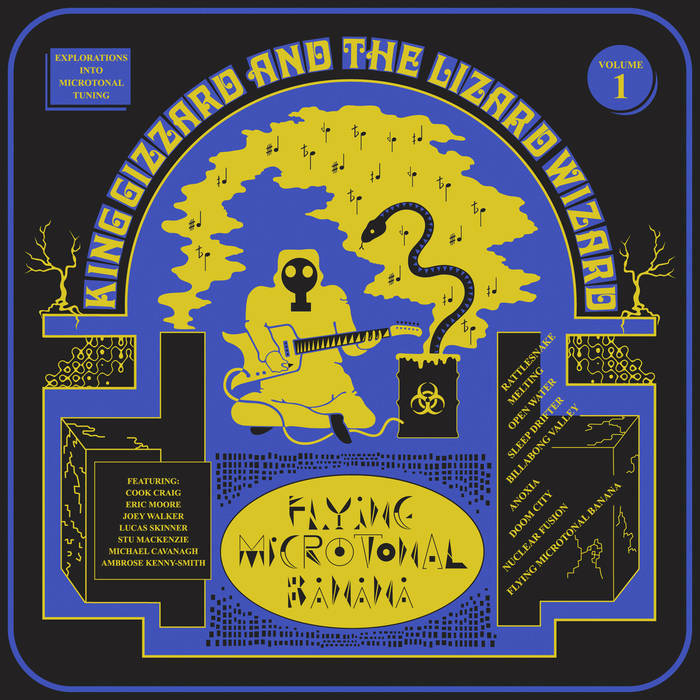 It’s always hard to place a King Gizzard record within a particular genre, and FLYING MICROTONAL BANANA is no different. There are shades of new wave, psychedelic rock, indie rock, and even stoner metal on the stomping “Doom City.” The band weaves their way through these styles with a exotic, progressive sensibility, with a vaguely Middle Eastern and African flair thanks to prominent use of zumas, knotted synthesizers, and a vocal style that wouldn’t sound out-of-place on a Yes record from the late ‘70s. The album is also subtitled “Explorations into Microtonal Tuning,” and King Gizzard heavily emphasizes the use of guitars and bass with tones with intervals smaller than a semitone, typically the smallest musical interval used in Western music. The use of microtones allows for more complicated riffs that give even the shorter songs like “Anoxia” plenty of intricacy. The dual vocal and guitar harmonies are well-arranged, especially the descending riffs on “Open Waters” that match the eerie vocal delivery. While the band usually sticks to a propulsive rhythm that wouldn’t have sounded out of place in their pure surf rock days, the lumbering, heavy crunch on “Doom City” and twisty solos on “Melting” are further proof of FLYING MICROTONAL BANANA’s versatility. Complaining about a King Gizzard record being consistent may seem like I’m missing the point, but I think there’s a problem when the first three songs on an album in total are as long as the next six. Even though “Melting” and “Open Waters” start off well-enough, they don’t introduce enough new ideas within their run times to keep things from becoming stale as initially chaotic percussion and guitar work becomes stale. The opener “Rattlesnake” is a horrible start to the record, as it repeats one word incessantly in one of the record’s most uninteresting melodies. BANANA doesn’t flow very well, as it front loads its longest tracks and leaves the most concise tracks for the end, which is the opposite of how records are usually structured, but Gizzard doesn’t use this breaking of expectations in any meaningful way. The demanding release schedule that King Gizzard has set for themselves may have worked against them here. I found myself repeatedly wanting more; more riffs, more songs, more ideas, and more interesting vocals. It’s not a bad record by any means, as the performances aside from the vocals are strong and there’s clear musical craftsmanship at work here, but it is certainly an incomplete record. Nonetheless, it’s a successful experiment with microtones that is likely to pan out more in the band’s other releases, but not enough on FLYING MICROTONAL BANANA.